It is impossible to escape preconceived notions. To have expectations is to be conscious. When the audience can escape these contrived assumptions and enjoy a surprising or remarkable presentation, magic happens. Mark Morris returned to Seattle at On the Boards on October 5, 2012, with a magical cast of talented individuals, including none other than legendary soloist, Mikhail Baryshnikov. When word hit that Baryshnikov would be appearing, social media and the audience’s expectations rose to a dull roar. The atmosphere of the theater Saturday evening was so abuzz it created a palpable sense of anticipation. Pleasantly astonishing were the sheer devotion and proficiency of the dancers. At no point did the audience have to question the technical precision of the performers. The dancers charmed the audience with their use of comedic and satirical gestures alongside simple country rhymes inThe Muir. Soloist Laurel Lynch was poignantly funny in “Sally In Our Alley,” utilizing an exquisite line to compliment the lyricism of her male partners. The piece was not supported by the formal length tutus and black trousers, which obscured subtle moments and seemed to contrast the boundless movement quality. Morris’ use of repetition was at times equally frustrating, as the same sections were repeated by the same people, interrupted only by the occasionally unpredictable transition. Morris was more successful with Petrichor. With an all-female ensemble costumed in flowing sheer tunics over shimmering unitards, he achieved a cast of supple and powerful bodies who looked fantastic under brilliant violet lighting by designer Michael Chybowski. But despite the dancer’s clear talent for music visualization, the extensive use of cannons and strict spatial patterns made the piece feel mildly contrived. The intent may have been to highlight flurrying feminine power, but the piece almost fell short of that goal when the audience was distracted by a whirligig of static shapes and busy phrases that appeared rushed. Despite its stiff form, the dancers, particularly soloist Amber Star Merkens, made the steps fly with intelligence and grace. Few others have such a gift for comedy in dance as Morris, but he did the audience a great service by utilizing the impressive comedic skill of Mikhail Baryshnikov in A Wooden Tree. Baryshnikov was immediately unmistakable when he entered the stage, but was also seamlessly integrated with the rest of the cast and looked comfortable alongside partner Michelle Yard. 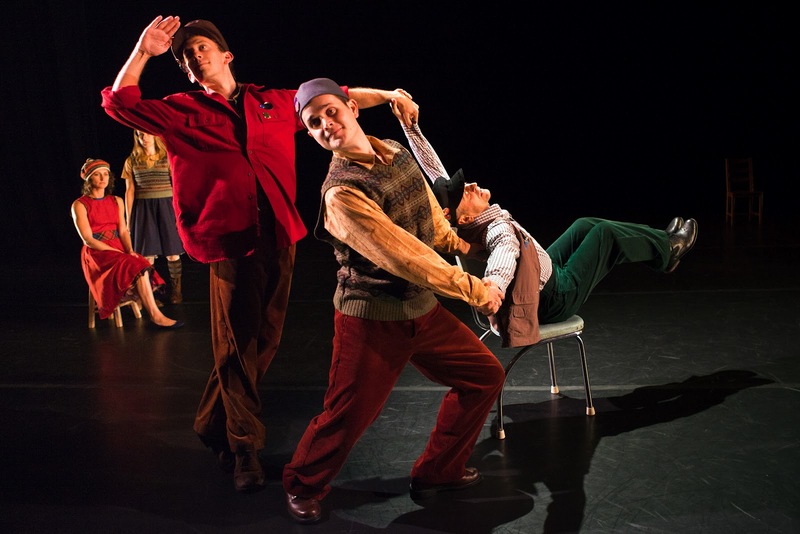 Baryshnikov’s physical cohesion with the ensemble fell away when he took full advantage of the humorous gestures set by Morris and the hysterically bizarre musical monologues by composer Ivor Cutler. The cast was dressed eclectically in vaguely Scottish country garb and told the story of a great wooden tree that felt like a parody of itself. The story was funny, even grotesque, and a fantastic representation of tongue-in-cheek wit. The storytellers also seemed to be part of the joke, and each carried the role well. Certainly when Baryshnikov swayed among “A Forest Full of Girls,” or tapped out a “Phonic Poem” on a kitchen chair, the audience wondered if we were laughing at them or with them. In Grand Duo, Morris chose to depict a flock of dancers who woke up by ceremonially swinging through space with crystallized confidence and intent. The dancers carved through space deliberately and soulfully, but the ultimate goal of their movement was unclear. It seemed as though they were inspecting a source of light energy, an unknown power they couldn’t attain. Truthfully, Grand Duo was not as fulfilling as one might expect. From the adagio that prophetically pointed to the infinite future to an exceedingly repetitive kaleidoscope effect, it felt unsubstantial. The work beautifully highlighted the technical abilities of the dancers through challenging balances and complex gestural phrases, but it fell short of its energetically charged promise. In an attempt to illustrate enlightenment, the dance came across as simply presumptuous. Therein lies the risk with high expectations—they are rarely fully realized. Unfortunately Morris’ choreography was not as transcendent as his cast, who brought fresh devotion and joy to each funny and surprising moment. The potential of the dancers was barely realized, as was Morris’, who seemed to be riding on the wind of his own coat tails.